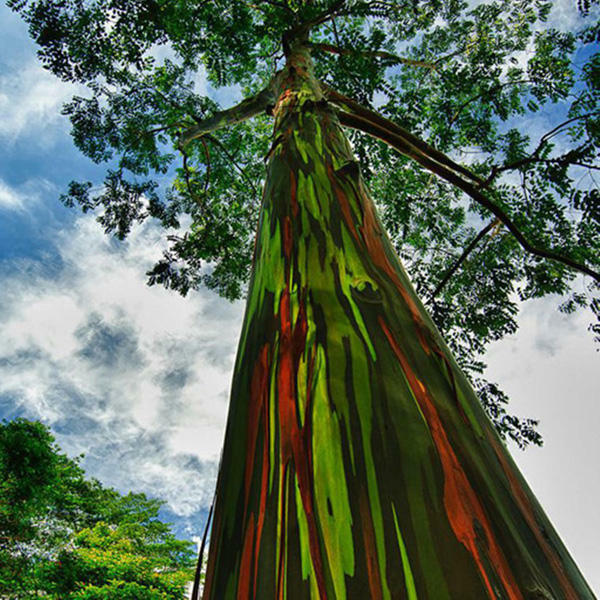 Rainbow eucalyptus grow in New Guinea, New Britain and Sulawesi. Its bark has yellow, green, orange, purple color, and even has a variety of colors. This unusual phenomenon is due to its bark fall off at different times. Different colors represent different age of bark. When its skin falls off, it will replaced by bright green endothelium. As time goes on, the barky color becomes darken gradually, and changes the color from blue to purple, and then turns to orange and maroon. Color eucalyptus are subtropical plants. Like light, wet, and drought tolerant, heat. some species grown in warm climates formerly,can not bear the temperature under -10 degrees. and the most suitable kind is fertile alluvial soil. 1. Soaking the seeds for 48 hours, mixing the seeds with sand and sowing in the nursery basin. Covering 1-2 cm thick contain fertilizer loose soil, cover film in the nursery basin after watering. 2. They will germinate after 10 days. 3. After germination, the soil must be kept moist, ventilation, to prevent high temperature burn seedlings. 4. Seedlings grow to about 10 cm, removing the film. When the seedlings grow to 40 cm, they can be transplanted to large basin or garden. 5. Please note that the weather of transplantation, we recommend rainy days.